Samsung's ATIV Book 9 Plus listed for $1,400, only 7.5 hours battery life? Discussion in 'Microsoft Surface Pro' started by Spaniard, Aug 9, 2013. Bigger screen -> smaller battery life. Where're you, mitchellvii? Back when the company first showed off the (horribly named) laptop in June it promised an excellent 12 hours of battery life, which would make the Ativ Book 9 Plus a mighty competitor to the much lower-resolution MacBook Air. In today's press release, however, Samsung has dropped that estimate to a far-less-impressive 7.5 hours, and on its website it's quoting 11 hours of battery life. It's not clear what's changed, and we've reached out to Samsung for more details. Don't worry, he'll be back to defend it. Um, ATIV Book 9? I am going to buy the ATIV Q, completely different animal. Have nothing in particular to say about the ATIV 9. 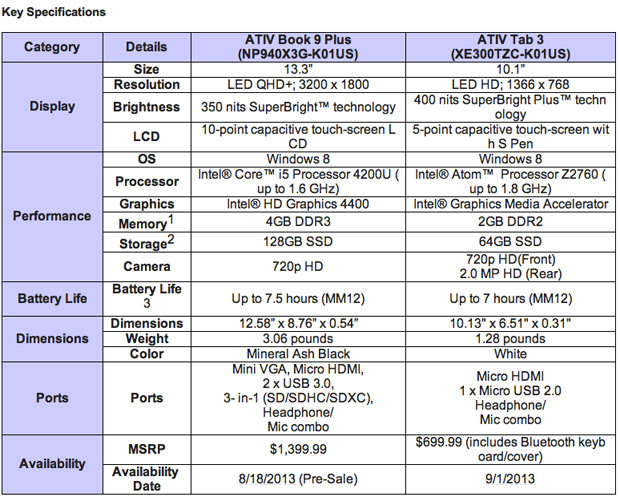 Yes the ATIV-Q is still not on the market as far as I know. Was feeling tempted by the Sony Duo but don't like the hinge on that one. Would like to see the new Dell XPS 11 too before doing anything but who knows when that will come out? Plus my GF thinks its cute I have a Papa Surface and she has a Baby Surface, lol, yeah I know, right. Lame. I still think you should lay hands on an Ativ-Q before taking the plunge. These devices can be seriously disappointing and we all know what a slick video editing department can do to an otherwise craptastic device. On another note, the Touch Screen Monitor I got for my now returned Pro works wonderfully in Windows 7. Whodathunkit? Man you should have given Mitchellvii some warning. Now he is on the ground holding his groin in pain. Could it be the Haswells known USB 3 issues?